It’s been an interesting year. Youngest son went off to college across the country, and DH does a fair amount of travel in his work. My nest is pretty empty sometimes! When CollegeGuy left, I planned a trip for his winter break return. I knew we’d all need some face time. 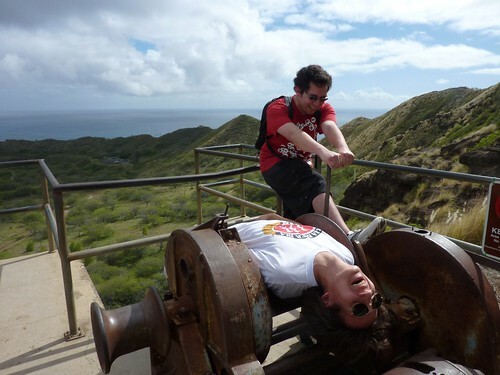 Last week we traveled to Honolulu for some fun in the sun. 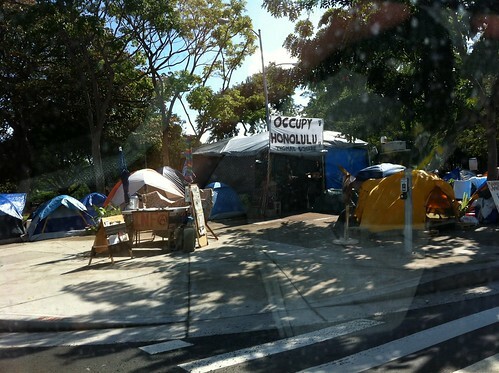 The Occupy Portland camp may be shut down, but there’s still an Occupy Honolulu. 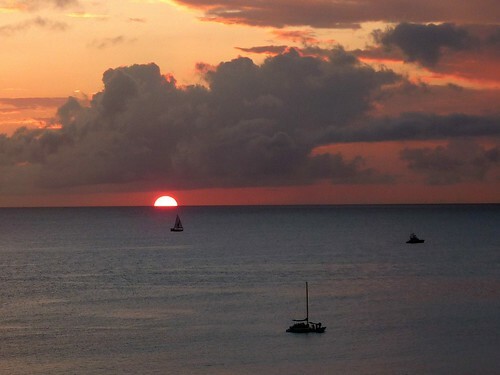 Our first night’s sunset was spectacular, but then they all were. 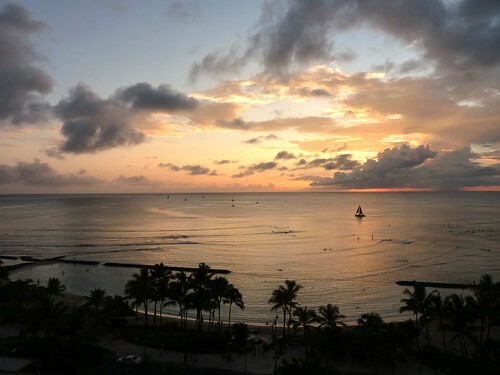 We were in a 12th floor condo in Waikiki, facing west. 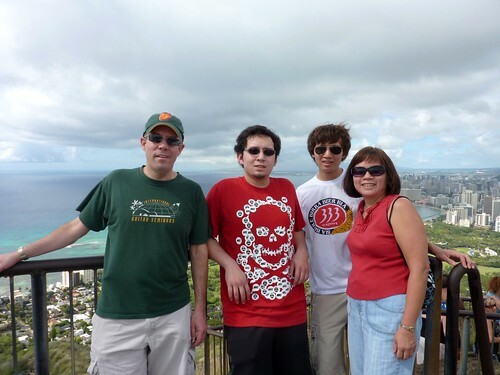 The next day we hiked to the top of Diamond Head (760 ft at the summit), the volcanic crater that overlooks Waikiki. You can see the hotels in the background. The views were spectacular all the way around. 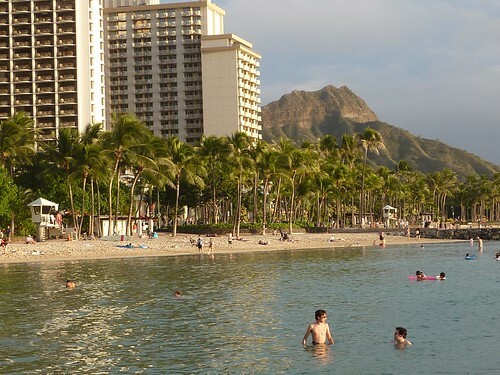 And that afternoon, we played on the beach at Waikiki and looked back up to where we had been. Thursday we paid our respects at the USS Arizona Memorial. The Arizona was sunk in the raid on Pearl Harbor in 1941 that drew the US into World War II. The memorial is a simple white structure which spans the submerged hull of the ship, where 1102 sailors are still entombed. It’s a stark, somber place, beautiful in its simplicity. The ship itself still leaks oil from its tanks; it bubbles up and spreads across the water. 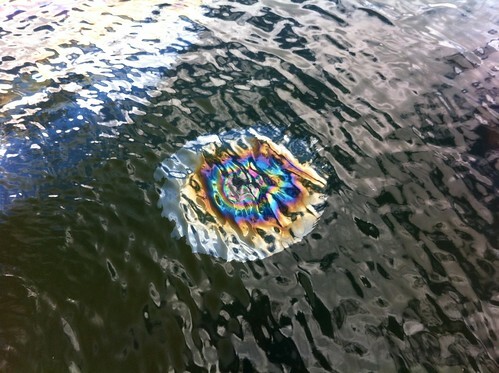 There is an estimated 500,000 gallons of oil aboard the ship, which is monitored for environmental hazard. We also toured the USS Missouri, which is berthed next to the Arizona. The Missouri was the site of the signing of the Formal Instrument of Surrender that ended World War II, so the ships are bookends of the war. 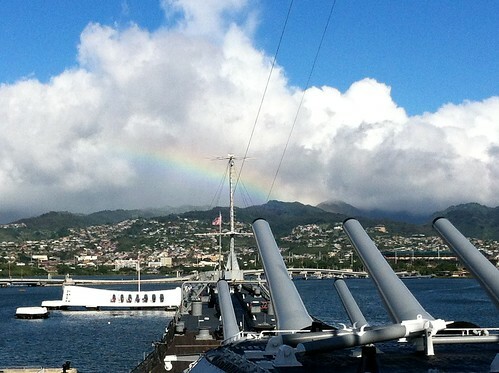 The end of our visit found us looking at the Arizona Memorial, the guns of the Missouri, and…a rainbow. Somehow fitting, I thought. I did have time for some knitting on this trip; I took Thrumbelina with me. 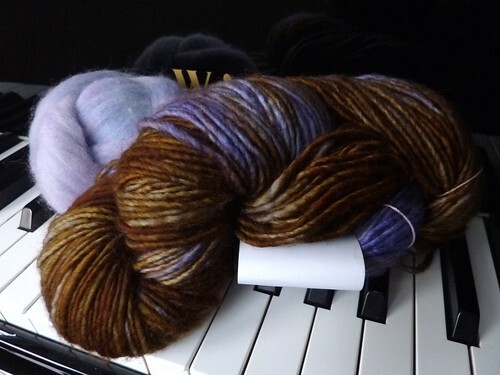 This is the Madeline Tosh Merino yarn that I showed you a few posts ago. It’s dreamy to knit with, but easier to split with my needle than the Malabrigo Worsted. 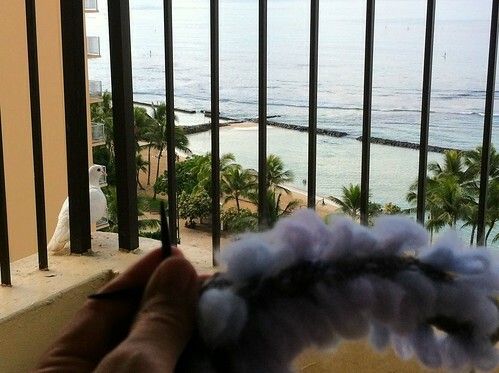 It wasn’t too warm on the lanai to knit with thrums! This entry was posted in Knit, travel and tagged diamond head, hawaii, oahu, USS Arizona, USS Missouri, waikiki. Bookmark the permalink. Looks like y’all had a wonderful vacation. Your photos, as always, are beautiful! How wonderful that you were able to get all your menfolk together and in such a beautiful location! It looks like you had a terrific vacation! Murder shots are a staple of all of your vacations? In.ter.est.ing.